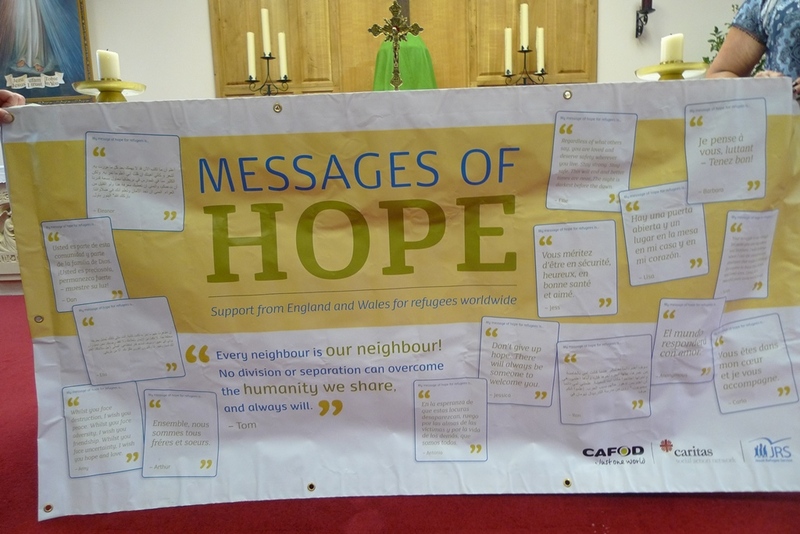 This year, Refugee Week runs from 16-24 June. 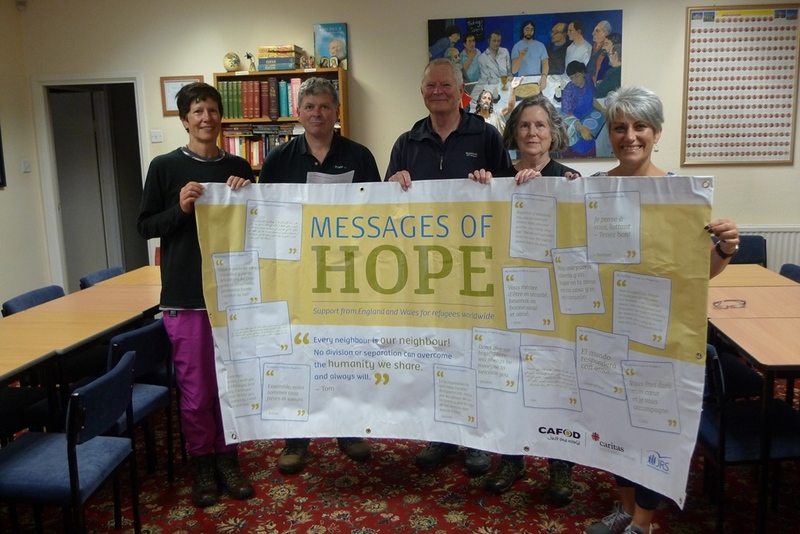 In September 2017 Pope Francis launched Share the Journey. Share the Journey is a global campaign calling on world leaders to make a united, global response to the plight of refugees and migrants worldwide. The United Nations are meeting in September this year to agree new global agreements: one on migration and one on refugees. The Holy Father has spoken of this moment as a unique opportunity for Catholics worldwide to put pressure on governments to respond with compassion by placing the human dignity of people on the move at the heart of these new agreements. 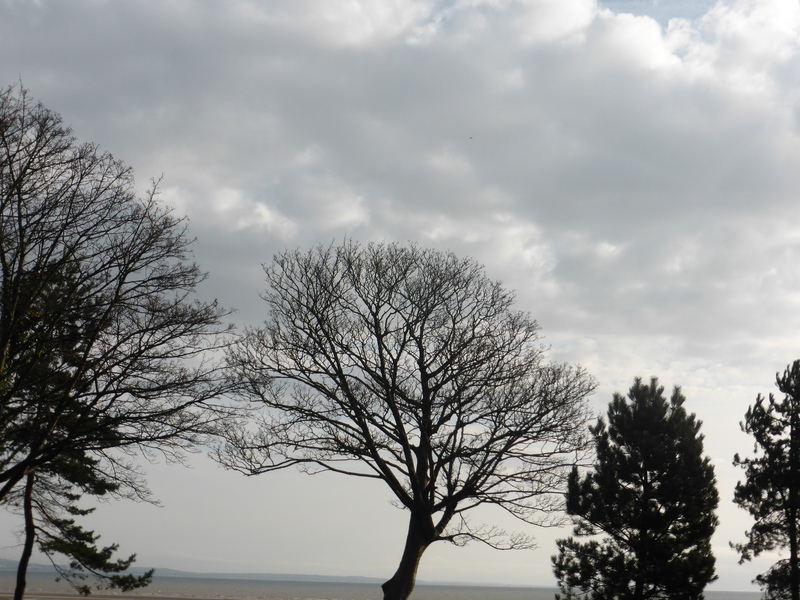 One of the first parishes to answer this call to action in the Diocese of Menevia, was Our Lady, Star of the Sea in Mumbles, Swansea. 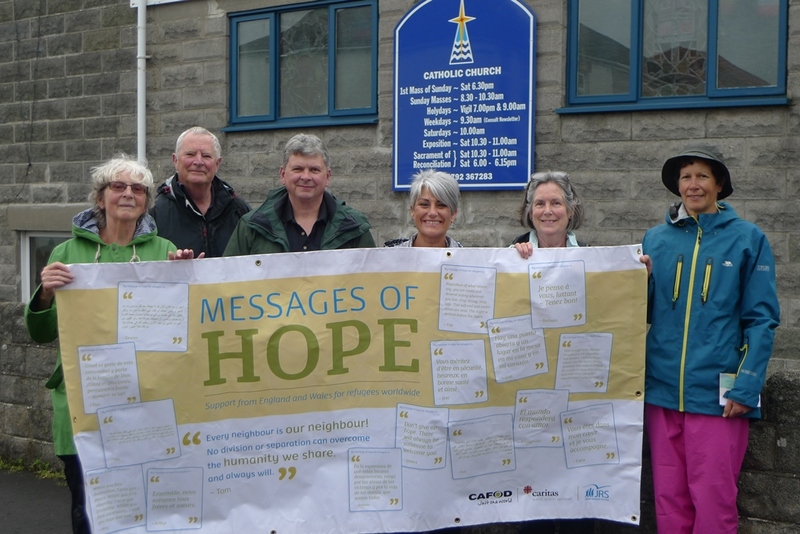 Bishop Thomas Matthew Burns, is leading from the front by giving his public support to the Share the Journey campaign asking us all to “reach out” – to not turn away. 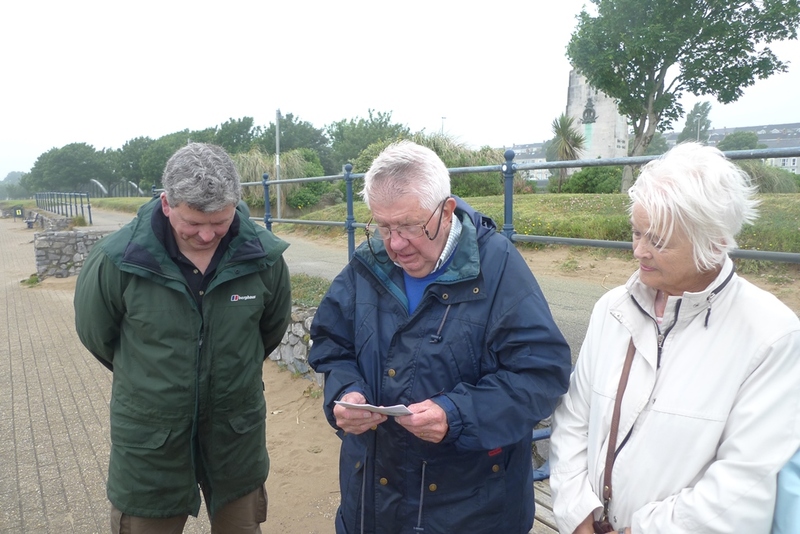 On Sunday afternoon of 17 June, Father Mansel Usher lead the way, walking along the beautiful Mumbles beachfront. 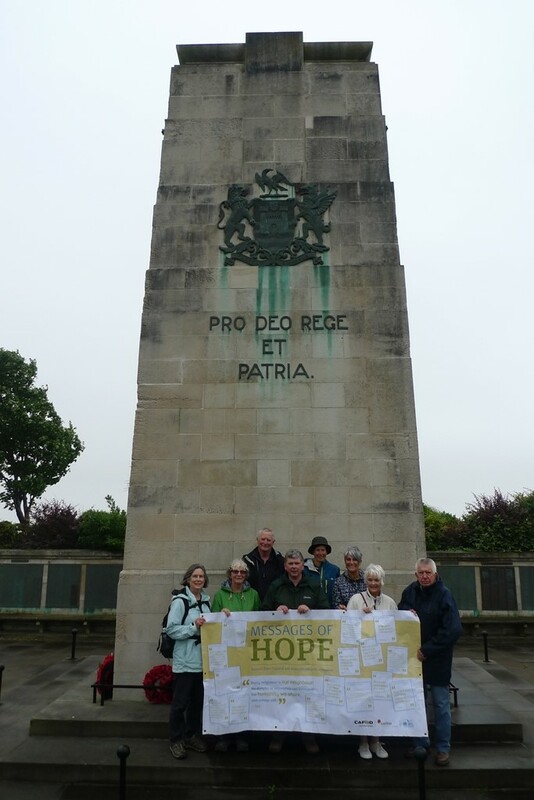 In total, the parishioners clocked up 65 miles between them. What a tremendous effort! The Vatican hopes that Pope Francis’ intervention will galvanise action in the same way that the encyclical Laudato Si’ influenced the Paris climate agreement in 2015. 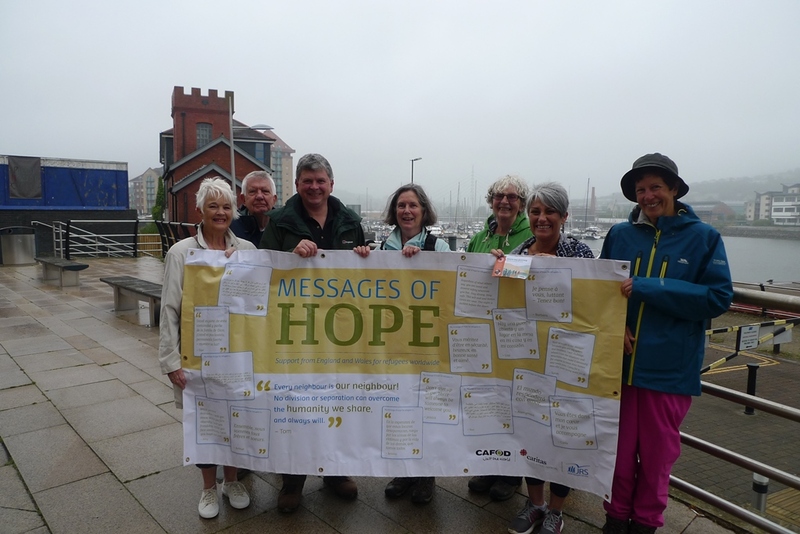 CAFOD has launched a petition to the UK Prime Minister, urging Britain to take a lead role in ensuring that the human dignity of refugees and migrants is respected; that vulnerable persons are protected; that safe and legal routes are provided; that access to education and foster care for young people who have been separated from their families is available; that migrants are protected from exploitation, forced labour and human trafficking; and to ensure that all countries host their fair share of refugees. Can you speak up for refugees and migrants? Show your support online here. 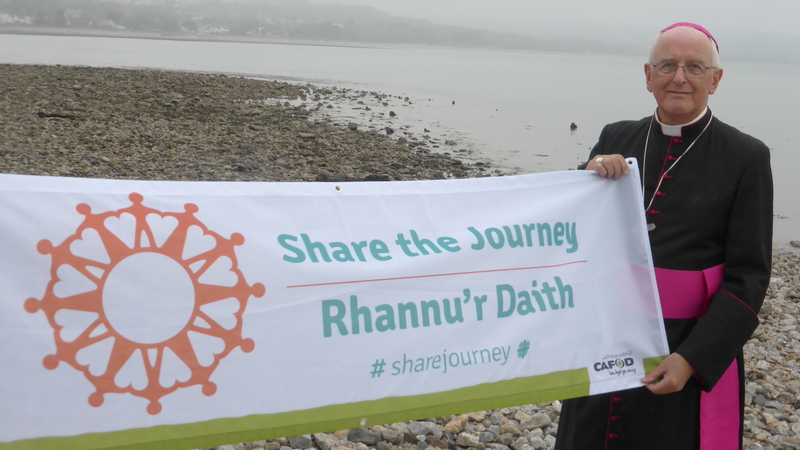 Take a look at the #sharethejourney logo – it’s been used by Catholic organisations across the world, including CAFOD, CSAN (Caritas Social Action Network) and JRS (Jesuit Refugee Service) in the UK to show that we are campaigning together. Every stranger who knocks at our door is an opportunity for an encounter with Jesus Christ, who identifies with the welcomed and rejected strangers of every age. Grateful thanks to Tony O’Kane for taking the photos of the walk. 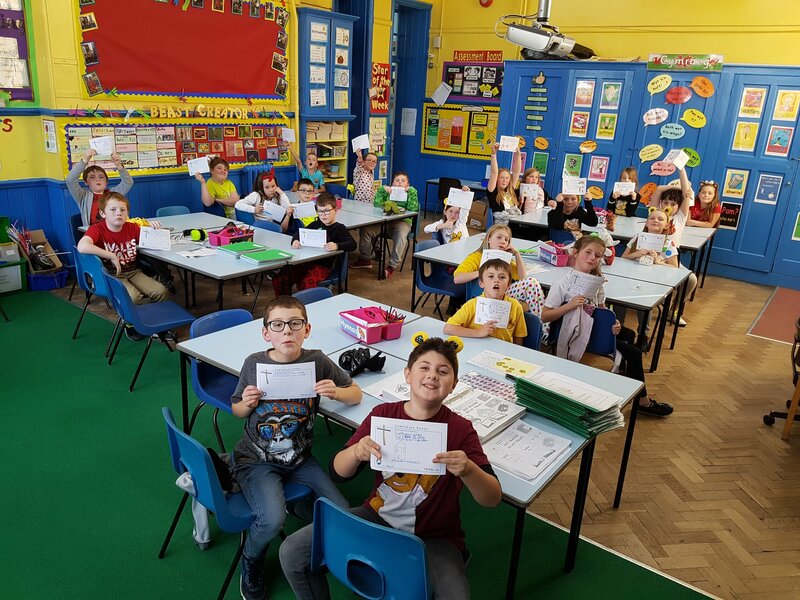 CAFOD South Wales were delighted to receive an invitation from Jenner Park Primary School in Barry to give an assembly focussing on the international development work of CAFOD. 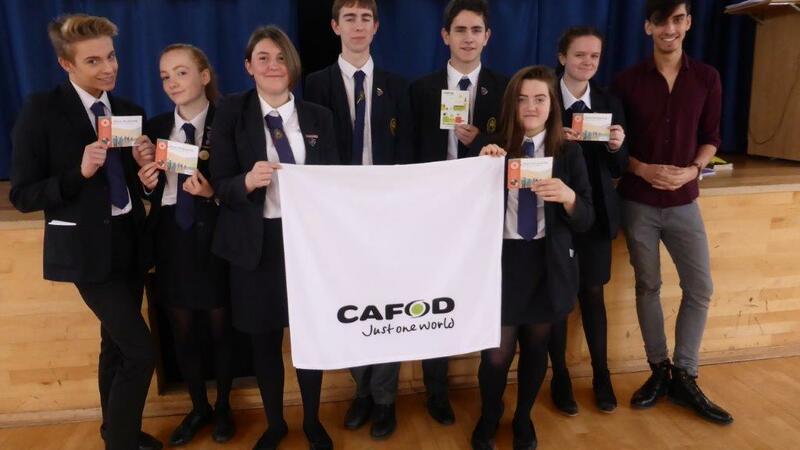 A member of our Education volunteers team was given a very warm welcome before assembly and was able to start the morning with an explanation of what the letters that make up CAFOD mean and that CAFOD works and helps people living in poverty, whatever their race, culture and religion. No-one is left out. What is Earth Hour? And why should we be interested? Earth Hour is an annual global celebration where people switch off their lights for one hour to show that they care about the future of our planet. It’s the tenth anniversary of Earth Hour and it’s estimated that over 6 million people will take part in the UK. 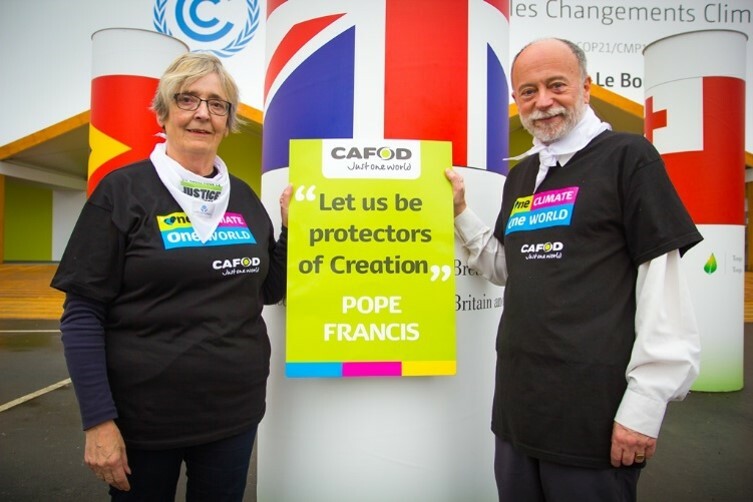 CAFOD is speaking out about climate change because it is the single biggest threat to reducing poverty that exists today. Whether it’s floods destroying livelihoods or unpredictable rains leaving millions hungry. The last three years have been the hottest on record. It’s estimated that nearly 1 in 6 species are at risk of becoming extinct – all down to climate change. We have just one world and it’s changing fast. It’s never been more important to show that we care. In his encyclical Laudato Si’, Pope Francis calls on us all to make simple daily gestures to care for the world’s poorest people, for future generations and for the earth, our common home. This is an opportunity to live wisely, think deeply and love generously. Since the Paris agreement in 2015 and the UK’s own Climate Act – there have been strong calls for action – but the need is urgent and now is the time to act to protect our beautiful planet Earth. Earth Hour is a global movement, which brings millions together across the world to call for greater action. In 2016 a record number of countries took part – 178 countries – in fact and each year more countries come on board. Famous landmarks around the globe take part – the Sydney Opera House, the Eiffel Tower, Buckingham Palace and Edinburgh Castle and in Wales, the National Waterfront Museum in Swansea, Cardiff Castle and the National Library of Wales, the Principality Stadium and the Liberty Stadium, as well as many other cities, towns and communities like our very own across the world will switch off their lights and come together for an hour, to join a global show of support for action on climate change. Will you join us tonight (Saturday 25 March) at 8.30 p.m. Sign up, switch off your lights and show you want action on climate change. Get to know more about climate change by reading about our latest campaign. Let us pray for the earth, our common home. Send us an update if you take part. 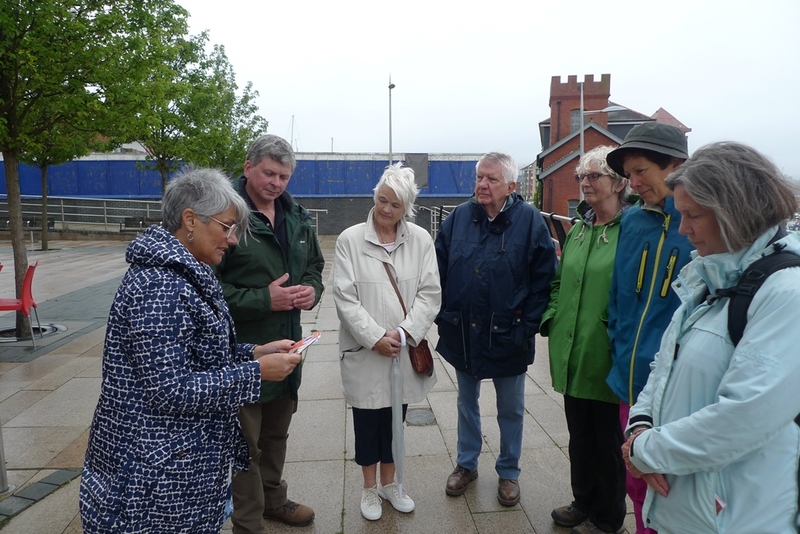 We’d love you to help us with our campaigns too. There are many ways to get involved! 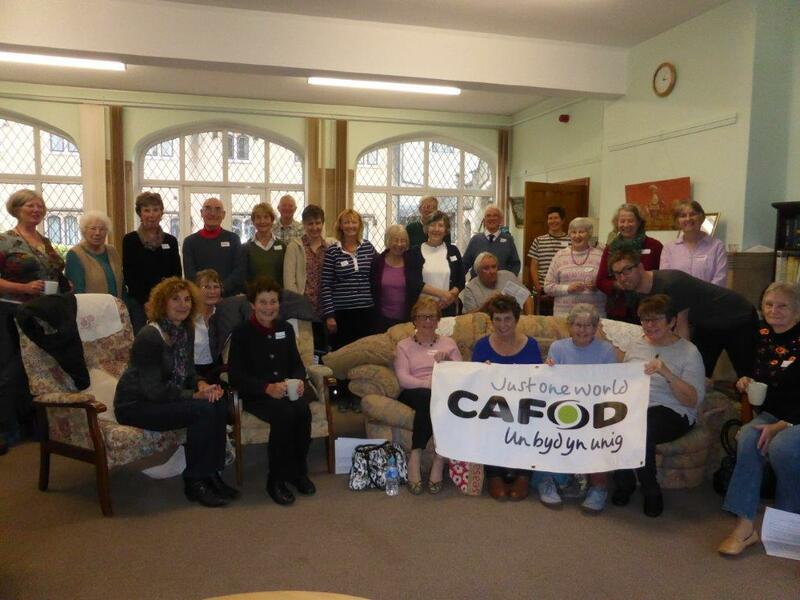 CAFOD retreat – BOOK YOUR PLACE NOW!